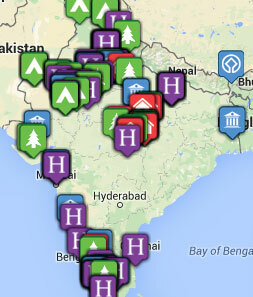 Tribes Overall: "This was our 5th trip to India but Delhi and Rajasthan more that lived up to our expectations. We were expecting the Taj Mahal to be impressive but there was so much more - the Jain temple complex at Ranakapur and many other amazing buildings with wonderful carvings"
Tribes Service: "From the outset, we have been impressed with the way our holiday was handled by Paul Cook especially as you helped us to maximise our enjoyment of a birthday and silver wedding anniversary while we were away. The service was efficient, professional and friendly." Guides: "This grade particularly refers to our driver. Mukhtiar Singh who was totally reliable, very friendly and helpful as well as being an excellent driver The individual tour guides were variable between the grades of average to excellent. " Social & Environmental Responsibility: "We certainly found local people to be friendly on the whole. Constant attention from street traders was irksome at times but to be expected and rubbish filled streets wasn't pleasant but that's India!" The position and accommodation was good but we were disappointed with the service. It wasn't friendly like a homestay but it didn't sufficiently function as a hotel either. If we met the owners, we were unaware of it. Our stay here was amazing. We were treated like royalty We were upgraded to the best room in the house. The accommodation and food was excellent. The service was personal and second to none - efficient, friendly and charming. We had the most fantastic time here with wonderful memories that will remain with us forever. Many thanks to all concerned. A perfect home stay in a great position. Kiran was a great hostess, a mine of local information and extremely friendly. It really felt like a home from home and we enjoyed our stay immensely. The food was great too! "Everything was just great but in particular - an unexpected visit to the film set of the Marigold Hotel where we were treated to a personal tour of the set - a special candle-lit meal on our anniversary set by the roof top pool in front of a fire, a magical evening. Beautiful colours everywhere - the flowers, the women's dresses and the smell of food cooking and incense burning."